Last week, I shared with you the downstairs areas of the wonderful home of Jo from Desire to Inspire and what an absolute cracker it is! I left you at the bottom of the stairs, so it’s only fitting that we pick up today at the top! The super stylish and eclectic vibes continue upstairs in Jo and Kelvin’s home where no nook is left undecorated! 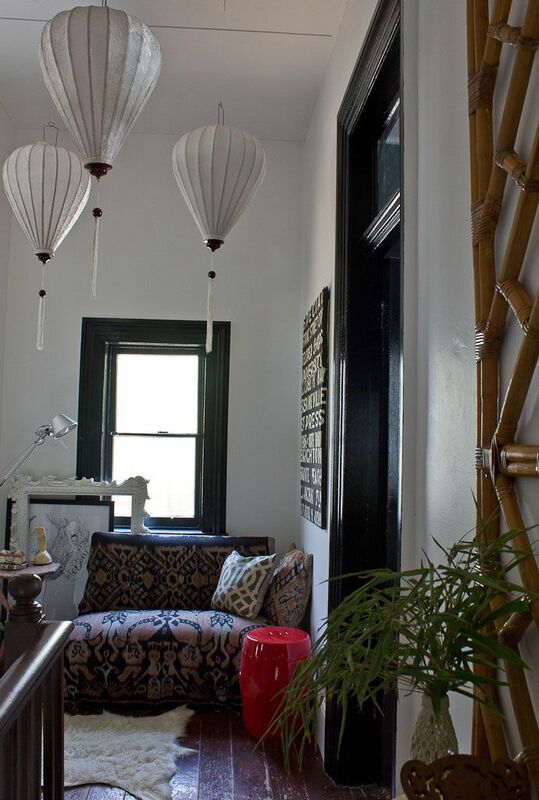 Beautiful silk lanterns hang in the staircase and a cosy seat greets you at the top of the stairs. The layout upstairs comprises of two large rooms, one of which Jo utilises as her light-filled study and the other is the boudoir. Over in the bedroom, the contrast is instantly noticeable by the presence of the dark walls. This is a large space which Jo and Kelvin plan to add an ensuite to in the future. Again, the space is full to the brim with beauty. Gorgeous pieces of furniture and great artwork are combined with a mix of textiles. I hope you have loved this tour through Jo and Kelvin’s amazing home, both upstairs and downstairs. I’m so grateful to have been invited to share this with you! Make sure you take a look at Desire to Inspire for daily doses of inspiring interiors! 2 Responses to "Upstairs in Denmark Hill with Jo from Desire to Inspire"
I didn’t know Jo was in Brisbane! Her house is lovely. Gorgeous pics. Yes, about an hour west of the City in a gorgeous colonial looking area!